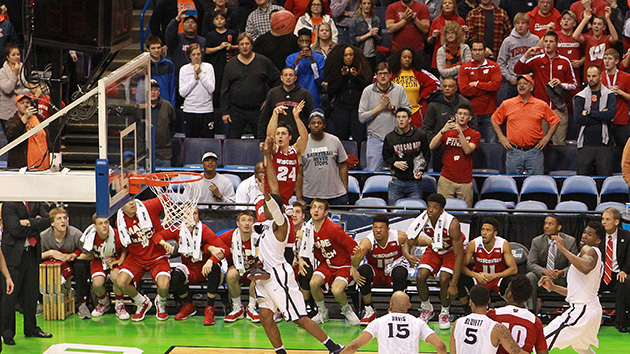 Everything you need to know about the Wisconsin Badgers as they begin the Sweet 16. The Case For: With all due respect to Gonzaga and Syracuse, the most surprising entrant in the Sweet 16 may be the Wisconsin Badgers. That might sound odd considering Wisconsin reached the Final Four the past two seasons, but it’s reflective of the fact that the Badgers were just 9–9 at one point earlier this season. Since then, however, they have gone 13–3, including wins over Indiana, Iowa, Maryland and Michigan State. Wisconsin actually plays better defense this year than it did either of the past two years (97.6 adjusted defensive efficiency in 2014, 96.3 in ’15), and it will need that kind of stout effort in a regional that boasts three of the top 10 offenses in the country this season, according to kenpom.com: North Carolina (No. 5), Notre Dame (No. 7) and Indiana (No. 8). And when the Badgers need a big shot, they have found this year’s version of Frank Kaminsky (2014) or Sam Dekker (‘15) in Koenig, who knocked down the game-tying and game-winning threes in the final 20 seconds to knock off second-seeded Xavier. The Case Against: Start with Koenig, who scored just two points and shot 1 for 8 from the field in the first-round win over Pittsburgh. Without a reliable perimeter threat its hard to imagine the Badgers getting past the Fighting Irish, much less the Hoosiers or the Tar Heels. And while they are a far different team than the one that lost games to Western Illinois, Georgetown, Milwaukee, Marquette, and Northwestern by mid-January, they also fell by 12 just two weeks ago in the Big Ten tournament to a Nebraska team that finished 16–18. Wisconsin isn’t deep, playing just seven players double-digit minutes, which is usually mitigated by its deliberate tempo but could be a problem if the other East Regional participants are able to speed the game up. And the Badgers’ lack of size won’t do them any favors, especially against the Tar Heel timber. Ethan Happ, at 6'9", is the only Wisconsin player who measures up (literally) to Carolina counterparts Isaiah Hicks (6'9"), Kennedy Meeks (6'9") and Brice Johnson (6'10"). SI Prediction: Beat No. 6 Notre Dame in Sweet 16. Lose to No. 1 North Carolina in Elite Eight.